THE cool change in the weather is the perfect reason to enjoy a cup of tea and a chin-wag with friends, so why not raise funds for a worthwhile cause while you're at it? 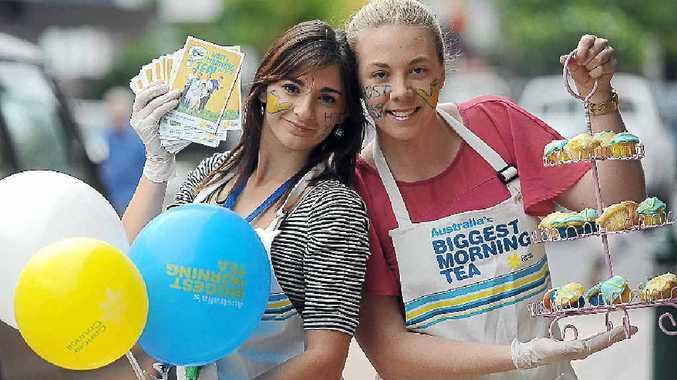 The Australia's Biggest Morning Tea event is upon the city again, and Bundaberg residents have been encouraged to sign up to host a morning tea in the next two months to help raise $115,000 for cancer research. Cancer Council Queensland regional fundraising co-ordinator Gemma Abela helped launch the annual cuppa for a cause in the CBD on Friday and at Hinkler Central at the weekend. "The official (Australia's Biggest Morning Tea) day is May 24, but people can host a morning tea throughout the months of May and June," she said. Miss Abela said she hoped about 300 people would sign up to host a morning tea, with 120 already pledging their support for this year's event. "We need another 180 hosts, so we are well on our way," she said. "So many people are affected by cancer." Miss Abela said the possibilities were endless when it came to planning a morning or afternoon tea. "It can be a group of friends, a business or organisation - it can really be anyone," she said. If morning teas aren't your thing, Miss Abela said people could go out for dinner and donate money afterwards. "The idea behind it is to raise funds for Cancer Council Queensland, but it's a good time to sit down and have a chat about how (people) can be more proactive in the fight against cancer," she said. We need another 180 hosts.